When designing an interior, sometimes a touch of color is all you need to define an area, like in this office designed by SNKH Architectural Studio. 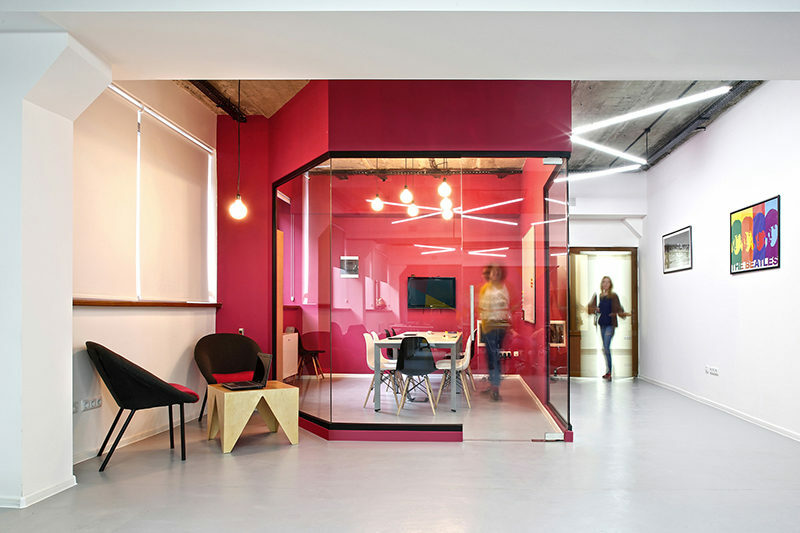 The interiors of the BigBek office in Yerevan, Armenia, have various areas in the office painted specific colors to highlight them. For this meeting room, they used hot pink on the exterior and interior of the room, creating a bright and bold look for the space that you can’t miss. For the kitchen within the office, bright yellow walls, floor, and ceiling clearly defines the area, while the designers have used a teal floor color to outline a casual seating area that surrounds the kitchen.